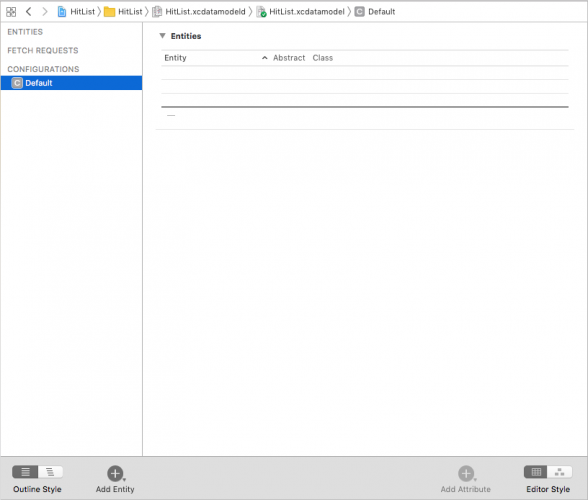 In this tutorial, you’ll write your very first Core Data app. You’ll see how easy it is to get started with all the resources provided in Xcode, from starter code templates to the Data Model editor. Display the fetched records using a table view. You’ll also get a sense of what Core Data is doing behind the scenes, and how you can interact with the various moving pieces. 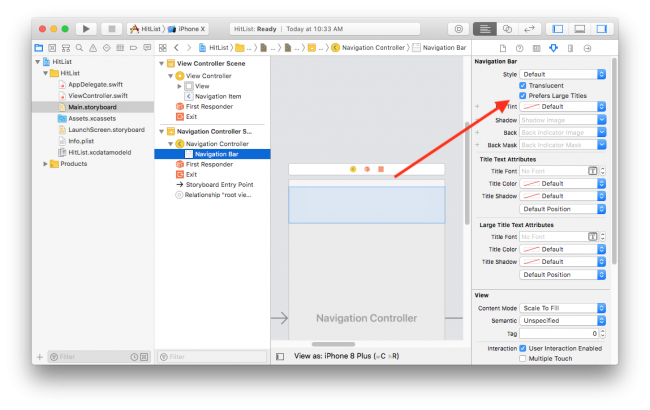 Open Xcode and create a new iOS project based on the Single View App template. 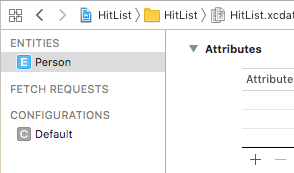 Name the app HitList and make sure Use Core Data is checked. Checking the Use Core Data box will cause Xcode to generate boilerplate code for what’s known as an NSPersistentContainer in AppDelegate.swift. The NSPersistentContainer consists of a set of objects that facilitate saving and retrieving information from Core Data. Inside this container is an object to manage the Core Data state as a whole, an object representing the Data Model, and so on. The standard stack works well for most apps, but depending on your your app and its data requirements, you can customize the stack to be more efficient. 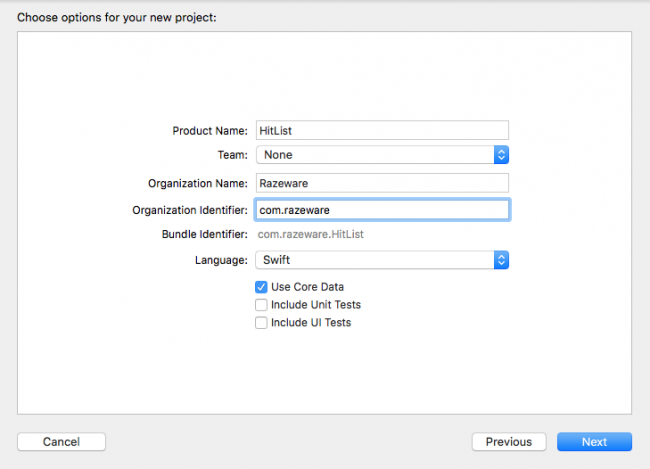 Note: Not all Xcode templates under iOS ▸ Application have the option to start with Core Data. In Xcode 10, only the Master-Detail App and Single View App templates have the Use Core Data checkbox. 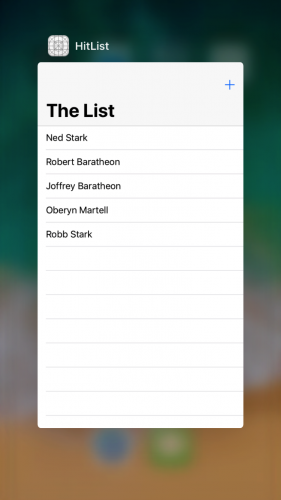 The idea for this sample app is simple: There will be a table view with a list of names for your very own “hit list”. You’ll be able to add names to this list, and eventually, use Core Data to make sure the data is stored between sessions. We don’t condone violence on this site, so you can think of this app as a favorites list to keep track of your friends too, of course! Click on Main.storyboard to open it in Interface Builder. 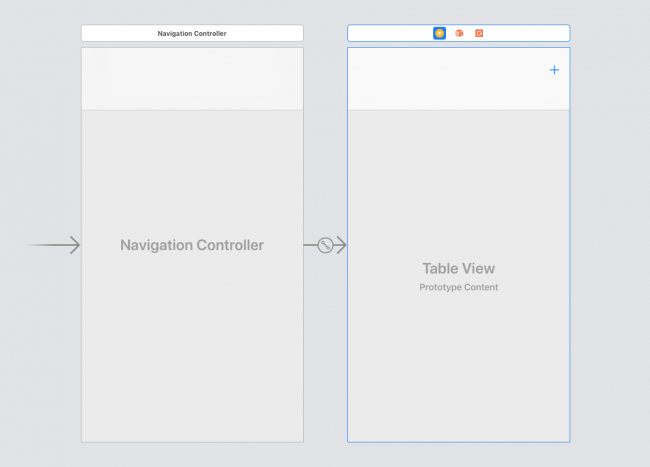 Select the view controller on the canvas and embed it inside a navigation controller. 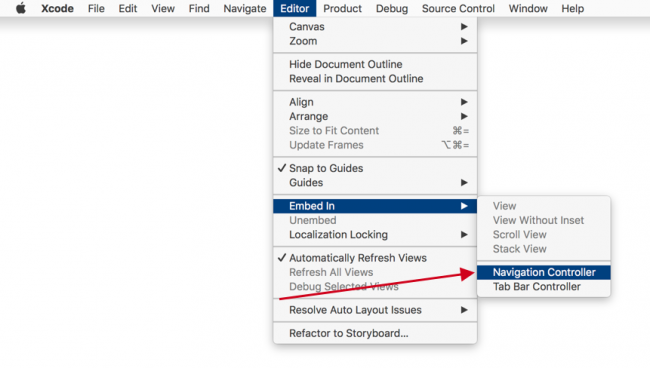 From Xcode’s Editor menu, select Embed In… ▸ Navigation Controller. Click on the navigation controller’s navigation bar to select it, then click on Prefers Large Titles in the Attributes Inspector. This will give the sample app a title style that matches Apple’s stock apps. Next, drag a Table View from the object library into the view controller, then resize it so it covers the entire view. If not already open, use the icon located in the lower left corner of your canvas to open Interface Builder’s document outline. Do this three more times, selecting the constraints Trailing Space to Safe Area, Top Space to Safe Area and finally, Bottom Space to Safe Area. Adding those four constraints will make the table view fill its parent view. Next, drag a Bar Button Item and place it on the view controller’s navigation bar. Finally, select the bar button item and change its system item to Add. Every time you tap the Add button, an alert controller containing a text field will appear. From there, you’ll be able to type someone’s name into the text field. Tapping Save will save the name, dismiss the alert controller and refresh the table view, displaying all the names you’ve entered. In case you’re wondering, you don’t need to set up the table view’s delegate since tapping on the cells won’t trigger any action. It doesn’t get simpler than this! 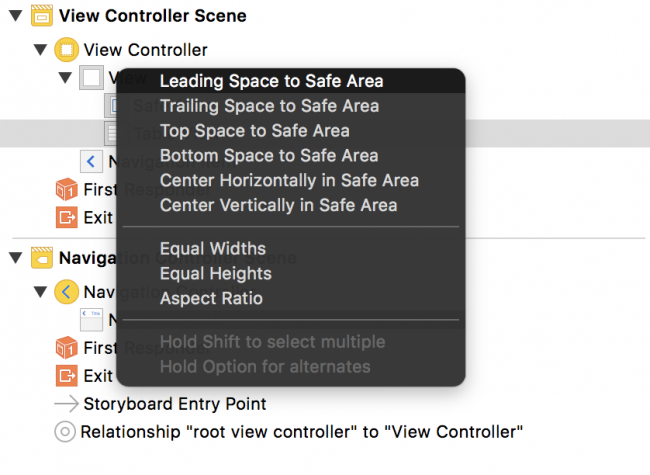 Open the assistant editor by pressing Command-Option-Enter or by selecting the middle button on the Editor toolset on the Xcode bar. Ctrl-drag from the table view onto ViewController.swift inside the class definition to create an IBOutlet. You can now refer to the table view and the bar button item’s action in code. 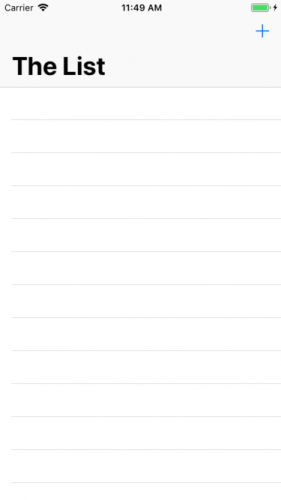 This will set a title on the navigation bar and register the UITableViewCell class with the table view. Note: register(_:forCellReuseIdentifier:) guarantees your table view will return a cell of the correct type when the Cell reuseIdentifier is provided to the dequeue method. 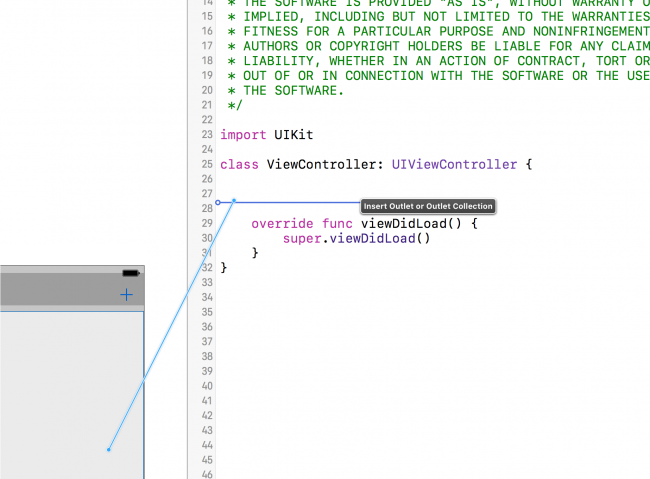 If you’ve ever worked with UITableView, this code should look very familiar. First you return the number of rows in the table as the number of items in your names array. Next, tableView(_:cellForRowAt:) dequeues table view cells and populates them with the corresponding string from the names array. Every time you tap the Add button, this method will present a UIAlertController with a text field and two buttons: Save and Cancel. 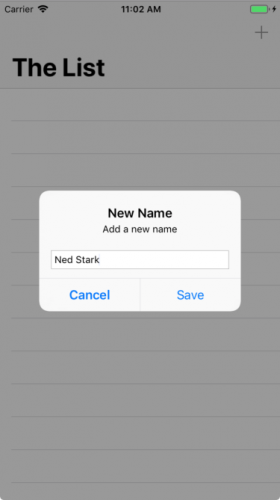 Save inserts the text fields current text into the names array then reloads the table view. Since the names array is the model backing the table view, whatever you type into the text field will appear in the table view. Your table view will display the data and your array will store the names, but the big thing missing here is persistence. The array is in memory but if you force quit the app or reboot your device, your hit list will be wiped out. Core Data provides persistence, meaning it can store data in a more durable state so it can outlive an app re-launch or a device reboot. From the home screen, tap the HitList icon to bring the app back to the foreground. The names are still on the screen. What happened? When you tap the Home button, the app currently in the foreground goes to the background. When this happens, the operating system flash-freezes everything currently in memory, including the strings in the names array. Similarly, when it’s time to wake up and return to the foreground, the operating system restores what used to be in memory as if you’d never left. Apple introduced these advances in multitasking back in iOS 4. They create a seamless experience for iOS users but add a wrinkle to the definition of persistence for iOS developers. Are the names really persisted? No, not really. 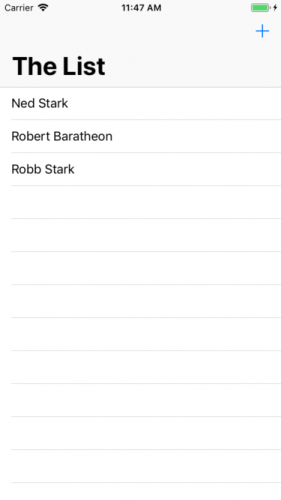 If you had completely killed the app in the fast app switcher or turned off your phone, those names would be gone. You can verify this as well. With the app in the foreground, enter the fast app switcher. You can do this by either double tapping the Home button if your device has one or slowly dragging upwards from the bottom of the screen if you’re on an iPhone X. From here, flick the HitList app snapshot upwards to terminate the app. If you’re working on an iPhone X, you have to long-press the app snapshot until a red delete button appears on the top right. After you remove the app from the app switcher, there should be no trace of HitList in living memory (no pun intended). Verify the names are gone by returning to the home screen and tapping on the HitList icon to trigger a fresh launch. 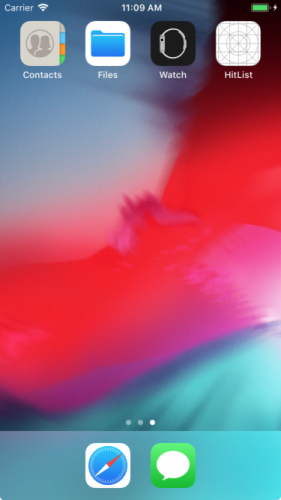 The difference between flash-freezing and persistence may be obvious if you’ve worked with iOS for some time and are familiar with the way multitasking works. In a user’s mind, however, there is no difference. The user doesn’t care why the names are still there, whether the app went into the background and came back, or because the app saved and reloaded them. All that matters is the names are still there when the app comes back! So the real test of persistence is whether your data is still there after a fresh app launch. Now you know how to check for persistence, you can dive into Core Data. Your goal for the HitList app is simple: persist the names you enter so they’re available for viewing after a fresh app launch. 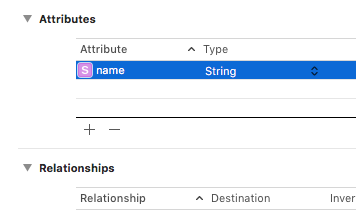 Up to this point, you’ve been using plain old Swift strings to store the names in memory. 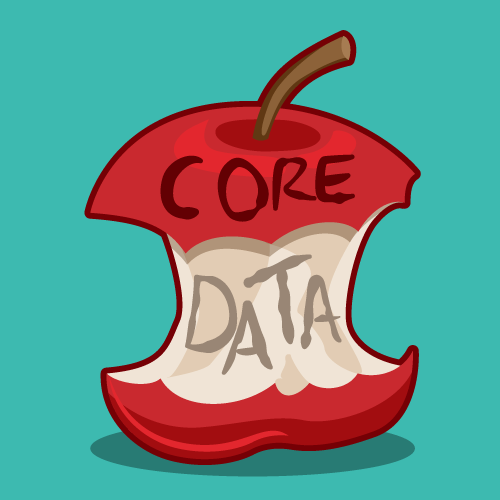 In this section, you’ll replace these strings with Core Data objects. The first step is to create a managed object model, which describes the way Core Data represents data on disk. By default, Core Data uses a SQLite database as the persistent store, so you can think of the Data Model as the database schema. Note: You’ll come across the word managed quite a bit when dealing with Core Data. If you see “managed” in the name of a class, such as in NSManagedObjectContext, chances are you are dealing with a Core Data class. “Managed” refers to Core Data’s management of the life cycle of Core Data objects. However, don’t assume all Core Data classes contain the word “managed”. Most don’t. For a comprehensive list of Core Data classes, check out the Core Data framework reference in the documentation browser. 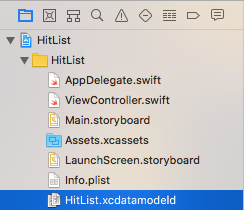 Since you’ve elected to use Core Data, Xcode automatically created a Data Model file for you and named it HitList.xcdatamodeld. The Data Model editor has a lot of features you can explore later. For now, let’s focus on creating a single Core Data entity. An entity is a class definition in Core Data. The classic example is an Employee or a Company. In a relational database, an entity corresponds to a table. An attribute is a piece of information attached to a particular entity. For example, an Employee entity could have attributes for the employee’s name, position and salary. In a database, an attribute corresponds to a particular field in a table. A relationship is a link between multiple entities. In Core Data, relationships between two entities are called to-one relationships, while those between one and many entities are called to-many relationships. For example, a Manager can have a to-many relationship with a set of employees, whereas an individual Employee will usually have a to-one relationship with his manager. Note: You’ve probably noticed entities sound a lot like classes. Likewise, attributes and relationships sound a lot like properties. What’s the difference? You can think of a Core Data entity as a class definition and the managed object as an instance of that class. Now you know what an attribute is, you can add an attribute to Person object created earlier. Still in HitList.xcdatamodeld, select Person on the left-hand side and click the plus sign (+) under Attributes. In Core Data, an attribute can be of one of several data types. This import is all you need to start using the Core Data API in your code. You’ll store Person entities rather than string names, so you rename the array serving as the table view’s data model to people. It now holds instances of NSManagedObject rather than simple strings. NSManagedObject represents a single object stored in Core Data; you must use it to create, edit, save and delete from your Core Data persistent store. As you’ll see shortly, NSManagedObject is a shape-shifter. It can take the form of any entity in your Data Model, appropriating whatever attributes and relationships you defined. The most significant change to these methods occurs in tableView(_:cellForRowAt:). Instead of matching cells with the corresponding string in the model array, you now match cells with the corresponding NSManagedObject. Why do you have to do this? As it turns out, NSManagedObject doesn’t know about the name attribute you defined in your Data Model, so there’s no way of accessing it directly with a property. The only way Core Data provides to read the value is key-value coding, commonly referred to as KVC. Note: KVC is a mechanism in Foundation for accessing an object’s properties indirectly using strings. In this case, KVC makes NSMangedObject behave somewhat like a dictionary at runtime. Key-value coding is available to all classes inheriting from NSObject, including NSManagedObject. You can’t access properties using KVC on a Swift object that doesn’t descend from NSObject. Before you can save or retrieve anything from your Core Data store, you first need to get your hands on an NSManagedObjectContext. You can consider a managed object context as an in-memory “scratchpad” for working with managed objects. Think of saving a new managed object to Core Data as a two-step process: first, you insert a new managed object into a managed object context; once you’re happy, you “commit” the changes in your managed object context to save it to disk. Xcode has already generated a managed object context as part of the new project’s template. Remember, this only happens if you check the Use Core Data checkbox at the beginning. This default managed object context lives as a property of the NSPersistentContainer in the application delegate. To access it, you first get a reference to the app delegate. You create a new managed object and insert it into the managed object context. You can do this in one step with NSManagedObject’s static method: entity(forEntityName:in:). You may be wondering what an NSEntityDescription is all about. Recall earlier, NSManagedObject was called a shape-shifter class because it can represent any entity. An entity description is the piece linking the entity definition from your Data Model with an instance of NSManagedObject at runtime. With an NSManagedObject in hand, you set the name attribute using key-value coding. You must spell the KVC key (name in this case) exactly as it appears in your Data Model, otherwise, your app will crash at runtime. You commit your changes to person and save to disk by calling save on the managed object context. Note save can throw an error, which is why you call it using the try keyword within a do-catch block. Finally, insert the new managed object into the people array so it shows up when the table view reloads. That’s a little more complicated than using an array of strings, but not too bad. Some of the code here, such as getting the managed object context and entity, could be done just once in your own init() or viewDidLoad() then reused later. For simplicity, you’re doing it all in the same method. If the names are actually stored in Core Data, the HitList app should pass the persistence test. With the app in the foreground, go to the fast app switcher and then terminate it. You saved to Core Data, but after a fresh app launch, the people array is empty! That’s because the data is sitting on disk waiting for you, but you’re not showing it yet. Before you can do anything with Core Data, you need a managed object context. Fetching is no different! Like before, you pull up the application delegate and grab a reference to its persistent container to get your hands on its NSManagedObjectContext. As the name suggests, NSFetchRequest is the class responsible for fetching from Core Data. Fetch requests are both powerful and flexible. You can use fetch requests to fetch a set of objects meeting the provided criteria (i.e. give me all employees living in Wisconsin and have been with the company at least three years), individual values (i.e. give me the longest name in the database) and more. Fetch requests have several qualifiers used to refine the set of results returned. For now, you should know NSEntityDescription is one of these required qualifiers. Setting a fetch request’s entity property, or alternatively initializing it with init(entityName:), fetches all objects of a particular entity. This is what you do here to fetch all Person entities. Also note NSFetchRequest is a generic type. This use of generics specifies a fetch request’s expected return type, in this case NSManagedObject. You hand the fetch request over to the managed object context to do the heavy lifting. fetch(_:) returns an array of managed objects meeting the criteria specified by the fetch request. Note: Like save(), fetch(_:) can also throw an error so you have to use it within a do block. If an error occurred during the fetch, you can inspect the error inside the catch block and respond appropriately. Great! They’re back from the dead (pun intended). Add a few more names to the list and restart the app to verify saving and fetching are working. 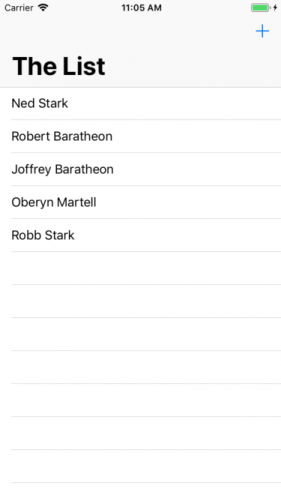 Short of deleting the app, resetting the Simulator or throwing your phone off a tall building, the names will appear in the table view no matter what. Note: There were a few rough edges in this sample app: you had to get the managed object context from the app delegate each time, and you used KVC to access an entity’s attributes rather than a more natural object-style person.name. Core Data provides on-disk persistence, which means your data will be accessible even after terminating your app or shutting down your device. This is different from in-memory persistence, which will only save your data as long as your app is in memory, either in the foreground or in the background. Xcode comes with a powerful Data Model editor, which you can use to create your managed object model. An entity is a class definition in Core Data. An attribute is a piece of information attached to an entity. A relationship is a link between multiple entities. An NSManagedObject is a run-time representation of a Core Data entity. You can read and write to its attributes using Key-Value Coding. You need an NSManagedObjectContext to save() or fetch(_:) data to and from Core Data. You can download the completed project for this tutorial using the “Download materials” buttons at the top or bottom of this tutorial. In this tutorial, you’ve already experienced several fundamental Core Data concepts: Data Models, entities, attributes, managed objects, managed object contexts and fetch requests. iOS @UpsideTravel. 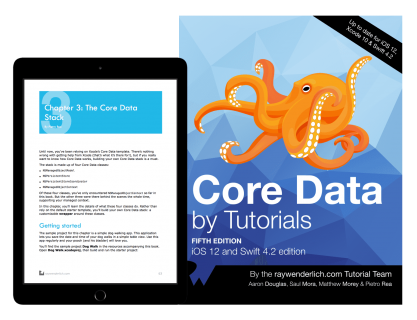 Co-author of Core Data by Tutorials and iOS 9 by Tutorials.